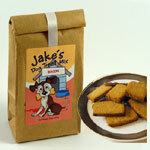 Your dog will love treats made with our Jake�s Dog Treat Mix. Just add water and oil. Makes over 100 one-inch treats. Handmade in a facility with wheat, powered egg and powerdered dairy. Manufactured in a nut-free facility. All natural with no preservatives. You can also add almost anything including small diced cooked meat and shredded cheese. Made with wheat flour, quick oats, cornmeal, vegetarian chicken powder, pasteurized egg, sugar.